Since I like to do product reviews (or at least talk about products I like), I thought I’d create a separate post for all the items I purchased to help us survive our trip to Chicago (that took place in May…that I still haven’t blogged about). Figured, there might be some folks traveling for the holidays who might be looking for travel supplies – so I wanted to go ahead and share! First off, we’re on diaper bag #3. THREE. For one kid. ONE. I like to be over prepared when it comes to having things in a diaper bag, but that means a lot of stuff, which means a bigger bag is needed. My first one (JJ Cole Satchel Diaper Bag) was really cute (which is why I wanted it), and it held a good amount, but it wasn’t the easiest to take everywhere with us because it’s bulky. The second diaper bag (Eddie Bauer Harrington Diaper Bag) we got was more of a messenger type, specifically for Josh, but we used it for a good while after it went into rotation, simply because I’m lazy and hated switching back and forth from one bag to another. It held a little less than the first, but by the point we were using it regularly, we weren’t putting *as* much stuff in our bags (so it worked out). But since we were planning on a long weekend in the Windy City, I feared that neither bag would fit our needs exactly. So I went in search of another diaper bag (cue eye roll from Josh here, haha). I went to Babies R Us and looked at a few, and I found a few that I liked, but then looked up reviews on Amazon, which quickly ruled them out. And then I came across the Skip Hop Grand Central diaper bag on the rack, and found that it had great reviews online AND it was cheaper on Amazon…so I did what any normal person would do, I left the store and ordered it online. Plus, Amazon had it in Cinnamon, which I liked much better than the brown or black, so it was a win for me! On top of needing a better diaper bag, little man needed a suitcase for his clothes. I found the Skip Hop Zoo Little Kid Luggage (Monkey) and fell in love. It is adorable, and it was big enough for all of his clothes that I packed (more on that later, hopefully!). It has a pull handle, as well as a strap that can be used to carry it like a book bag, which is helpful when you’re carrying your stuff, kiddo’s stuff, and trying to get through the airport. J and I checked our luggage, but we brought B’s as a carry on. I didn’t want to chance losing his clothes/immediately necessary items if our luggage disappeared, so, almost all of his stuff came on the plane with us. This little suitcase fit under the seat in front of me, along with the diaper bag that was serving as my purse for the long weekend. And while I love our normal stroller, I was not up for taking our not-exactly-cheap City Mini on an airplane, only to gate check it and have who knows what happen while it was under the plane. So I looked for a (cheaper) secondary umbrella stroller. I found that a lot of them didn’t have a really good canopy, which is something I wanted knowing Chicago is windy, and in looking at the weather leading up to our trip…it wasn’t going to be pretty outside. I almost gave up, but then I found the Kolcraft Cloud Plus Lightweight Stroller. I really love this stroller, and it may or may not be currently hanging out in my car at the moment instead of the City Mini. It’s light, turns well, and has great coverage with the canopy. My only complaint is that the cup holder on the front piece is too small for B’s sippy cups (he uses the Playtex Anytime sippy cup). So we have to sit it in the seat with him, or use a strap to tie it to the stroller so we don’t lose the cup. That may be a deal breaker for some, but for the price of this stroller, I can deal. 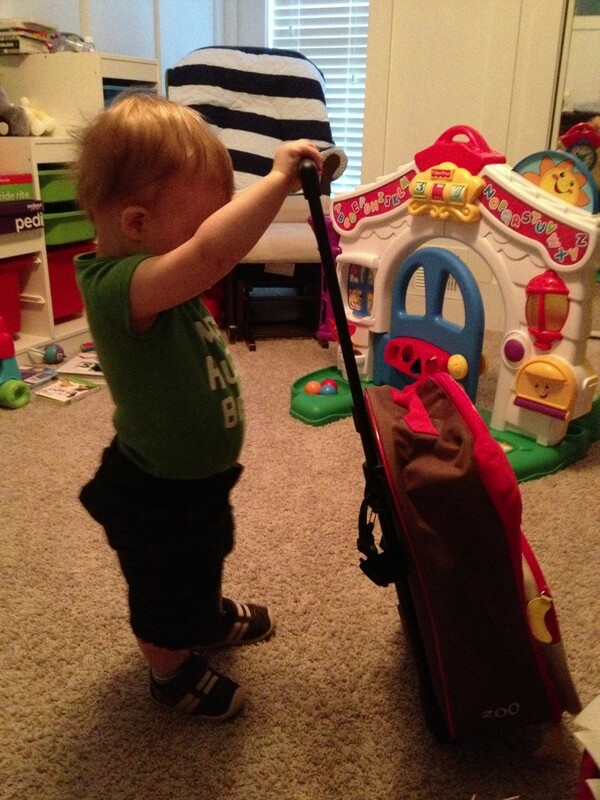 One thing that I love about this stroller is that when you collapse it, it stands up. So you don’t have to lay it down flat like a lot of other strollers. When we went to football games this season, we brought this bad boy with us, and would just collapse it, sit it next to guest services, and go on our way, not having to worry about the part where he sits getting dirty. I’m not sure that they stood it up on the plane, but, at least they could. And since we didn’t know how it’d be handled under the plane, we bought a gate check bag to store it in for the flight. Probably unnecessary, but it was easy to get the stroller in and out of, so we brought it along to keep the whole stroller clean. 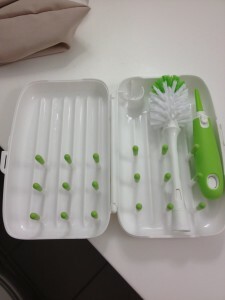 At the point of our trip to Chicago, B hadn’t knocked the bottle habit (meh), and I wasn’t about to pack 12 bottles for a trip, so we brought 4 for the 4 times B was using them a day, and I bought this fantastic bottle brush/cleaner by OXO (Tot On-The-Go Drying Rack and Bottle Brush). I packed a travel container with the dish detergent we used on B’s bottles, along with my shampoo, and we were set for cleaning! We left it on the counter in the bathroom while we were in the room, and when we were going out, we could fold it up and tuck it away so room service didn’t mess with it. It traveled well and it was great to have. 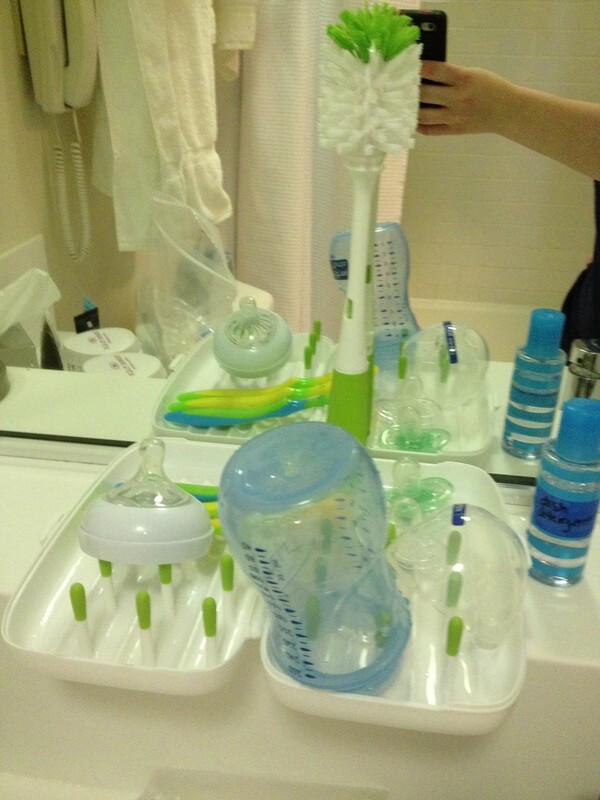 Definitely recommend this for cleaning bottles/sippy cups/pacis/etc. on the go! 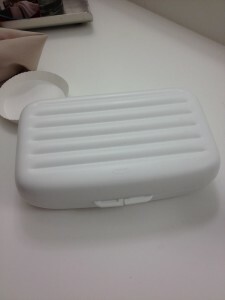 In use, on the hotel bathroom counter. Ready to tuck it away. Closed up and ready to be put away! Are there any travel products for kids out there that you absolutely love? Something you can’t travel without? Share it in the comments – would love to check it out! Note: WishIWereThereNow.com is a participant in the Amazon Services LLC Associates Program, an affiliate advertising program designed to provide a means for sites to earn advertising fees by advertising and linking to amazon.com.